eKnowledge Corporation is donating ACT and SAT test-prep software to military families and veterans. The programs come on a DVD or CD-Rom that includes over 11 hours of classroom video instruction and additional interactive learning. The program includes over 120 instructor video lessons and 122 question and answer movies. 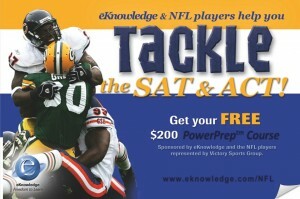 eKnowledge, a group of NFL players, and the Department of Defense have teamed up to distribute more than $16,500,000 of eKnowledge’s SAT/ACT PowerPrepTM Programs to military service members and their families. eKnowledge is a leading provider of interactive learning products and services. According to their website, they were pioneers in the field of advanced eLearning technology and the first to convert interactive classroom instruction to multi-media solutions including on-line streaming, CD and DVD ROM. Today, their College Test Prep and other advanced multi-media programs are being used by tens of thousands of students. Our on-line, CD and DVD interactive learning programs range from SAT, ACT, LSAT and other Test Prep courses, to highly effective diagnostic, teaching and learning tools for business, education and other institutions. This is good news for all service members who wish to pursue their education! This will lead them to better preparation for these important exams. In addition, it should be noted that VA benefits can be used to pay for standardized exams, which is great insurance for being able to afford it at all. I will be writing US medical licensing exams over the coming couple of years, and am very glad that the VA will cover these costs.